The wharekai was condemned after 15 years in 1962, and was demolished in 1970. The lack of reinforcement materials in the concrete meant that when there were movements of earth and people, the building began cracking. Some of the cracks in the walls were impressive for a still standing and still used building. 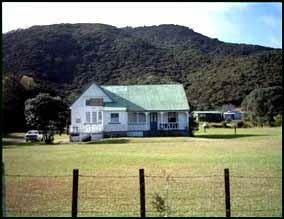 With no toilets and no dining hall, the community used the old School buildings (see left) as a marae. Tupaapaku were taken to lie in front of the Wharehui before being taken to the Urupa. The vacant ex-Te Rawhiti Native School house and buildings were renovated and the Ablution Block was built. It was then used for all Marae affairs while our people raised funds to rebuild the wharekai. It opened as a camping ground. Its purpose was to raise funds for a new wharekai. Later, when this was built, the camping ground fees paid for the future maintenance of the Marae buildings. It is now a marae for the Patu Keha whanau called the Kaingahoa Marae. The road was cut through Te Rawhiti, from the School in Kaingahoa Bay to the end of the peninsula at Kaimarama Bay , in 1970. While it made the world more accessible, it brought changes to our maare and our customs or tikanga. The Marae valley, was filled in with road fill to level the site. This was good as it doubled the flat land. The edge of the Wharekai marks the beginning of the valley slope. No buildings were permitted on the fill at that time, hence the moving of the Wharehui 8m towards the bank to accommodate the new wharekai on solid ground. The presence of the road changed the tikanga or traditional practices at the marae. Previously, most manuhiri or visitors arrived by boat. The atea or formal entry of the marae began on the beach of TeTawa Iti because tupaapaku were transported by boat to the marae and received on the beach. A gun used to be fired in to the air at landing, and in later times, the karanga alone announced its arrival. The coffin was carried up the gentle slope to the Wharehui. At the time of the road being discussed, the Maori Committee did not think that such an important point of tikanga was an issue that the Far North District Council would regard as reason enough to divert the road around the back of the marae. The road sits about 5 metres above the beach which is down a steep bank, thus cutting off the atea . 2 Responses to "Changes during the 1960s"
we (a german couple) have been in Rawhiti in 1994 for some days and we met a friendly man, called Blendy, who was leading the trail making people. Is he still living in Rawhiti? Would be nice to get an answer.